Complex structure with a lot of dark fruits, black currants and some mint. Soft, juicy ripe black fruit flavours on the palate with a fine tannin structure. 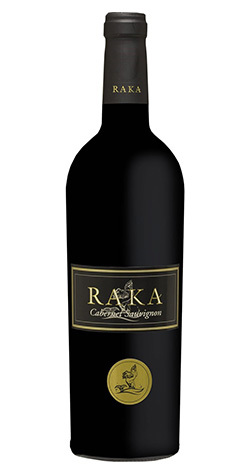 This Cabernet Sauvignon has a complex structure with a lot of dark fruits, black currants and some mint. Soft, juicy ripe black fruit flavours on the palate with a fine tannin structure. Grapes were sorted before a pure yeast culture was inoculated. The juice was pumped over the skins 3-5 times per day for 5 days. Once fermentation was complete, the wine was drained of the primary lees and transferred to a resting tank. Malolactic fermentation and a brief settling period preceded the wine to a combination of 225 liter barrels of French oak types. The wine spent between 12- 14 months is barrel before bottling and labeling. The Raka brand was named after Piet Dreyer's black fishing vessel. Piet's first love has always been the sea. For some 36 years he braved the storms and challenges of the coast, ever in search of the best catch. It is with this same passion that the Dreyer family now pursue the art of winemaking.